So, you’re creating your studio, and so far, you have everything you need, except for the best studio headphones for your specific needs and goals. Regardless of what you’re going to use your studio for, you will always need a great set of studio headphones. What are some of the best headphones out there? The best types and brands? Where do you even start looking? Sure, you could spend hours researching on your own and still feel unsure when you make your decision, or you could just take a gander below and see what we think are the best studio headphones there are out there. First, what are you doing? Are you recording, are you mixing, are you an audiophile just looking for the best studio headphones? Before you’re even able to decide what the best studio headphones are for you, you need to understand that there are two different types of headphones: Closed back and open back. Closed-back headphones are isolating. They’re designed to prevent outside sound from getting in, so you can shut the world out with these. In studios, these are used for recording via mics because they offer such excellent sound isolation, which is necessary when you’re using a mic to record so you can hear your recordings without any outside distractions. It’s important to note that these are different from noise-canceling headphones, which use sound waves to cancel external noise. One problem with closed-back headphones is bass quality. They don’t produce the same bass quality as open-backed headphones will, but the sound is neutral, so you can hear everything that’s happening. Open-back headphones provide a much larger sound because they let in the outside world, and emphasize sound quality over isolation. This means external noise gets in and inside sound gets out. Thus, they’re ideal for mixing, so if that’s your intended use, then these will serve you much better. It’s important to note that semi-open studio headphones do exist, but they probably won’t give you the best of both worlds unless you’re only using them for listening. We’ll start with the top four closed-back headphones, for those of you who are interested in those. These are probably the best studio headphones out there, period. They not only offer excellent sound isolation and minimal leakage out, but they also offer superior sound quality throughout all frequency ranges. In fact, this particular set of headphones has won high praise from professional audio engineers. They’re comfortable, too; the ear cups swivel a full 90 degrees, making them perfect for one-ear listening, and they come with a detachable cable. These separate ranges better than most other closed-back headphones, giving them a superior bass sound despite being closed. You can find them here. These studio headphones are likewise very high quality and are specifically designed for sound monitoring and critical listening. These provide very transparent and detailed sound, making them perfect for a multitude of applications. The sound isolation on these headphones is spectacular – something that is absolutely necessary when you’re recording. Whether you’re a musician or a freelance voice actor or recording something else, that is something that is critical. These headphones deliver spectacularly. The ear cups come with velour-covered cushions and the headband pad is detachable, both of which aid in the comfort of these headphones. Check them out here. 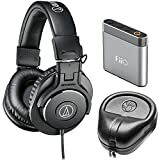 These headphones are less expensive than the previous two models but still provide excellent sound quality without needing to play with an equalizer. If you’re looking for the best studio headphones on a budget, these are the headphones for you. Don’t let the price fool you – these provide clean, clear sound quality that will allow you to hear things exactly as they were recorded. These are also exceptionally soft and comfortable, with ear cups that fit completely over your ears. They also come with a single cable, making them far more manageable than headphones with dual cables. The foam pads are a little less durable than what you will find with more expensive brands and models. However, for the bargain, these are more than worth it. Take a gander at them here. Shure’s SRH440 studio headphones are another great set if you’re on a budget. Designed with home and studio recording in mind these headphones provide good isolation from noisy environments. In fact, the high volume just to hear isn’t necessary with these, especially if your background is already pretty quiet. These also provide superior sound quality, especially for the price. If you’re recording, you need accurate, neutral sound, and these provide ensure that exceptionally well. Like the Sony headphones above, their most significant drawback is durability, with some saying these last a year to two years. They’re also heavy. However, these are another great option for people on a tight budget. See them here. Now, if you prefer open-back headphones, these are the top four that we recommend you take a look at. All of them have outstanding ratings. 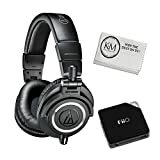 These are a great starter pair for anyone who’s looking for high-quality headphones that produce ultra-high quality sound across different genres. Unlike closed-back headphones, these have a substantial bass range that isn’t muddy and are clear in the upper ranges without being too bright or tinny. You also don’t need an extra amp for premium quality. They’re also very durable and extremely comfortable, even for people with bigger ears. They’re nice and lightweight as well, so they won’t feel like a block of concrete on your head after hours of listening. If you’re doing a lot of sound mixing, these are an excellent buy for you. Learn more about these here. 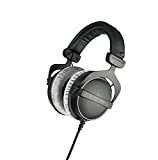 Music professionals around the world consider these to be among the best headphones out there. These headphones emphasize bass and treble over the mid-range, but still, provide clear and transparent sound across genres. That results in a slightly less neutral, but more natural, sound across all ranges. 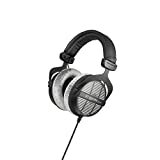 These are also lightweight and comfortable, with velour ear cushions and large cups that completely cover the ear. They’re made with typical German durability, so if you need a set of good headphones that will last, these are a good bet for you. Check them out here. Sennheiser is, quite possibly, one of the more well-known brands for headphones among music professionals. This model provides great transparent sound and superior sound separation, including solid bass that isn’t overwhelming or muddy. Higher ranges are very clear and bright without being piercing or tinny. If you’re looking for good headphones that will pick up defects in recordings, these are a fantastic choice. They’re lightweight and comfortable, with a silk lining and great padding that’s comfortable for hours of wear over your ears. One potential drawback is that they’re very tight right out of the package, but you can put them around some books or other large objects and leave them for a day, which helps to loosen them up. Look at them here. If you really want to go high-end, check out the Sennheiser HD 800s. They’re expensive but worth it if you can afford them. These AKG headphones feature the classic design we tend to think of when we think of professional headphones. Whether you’re using these in a home studio, with a portable studio or for anything else, this classic headphone provides great quality, especially if you’re on a budget. The sound quality offers robust and clean bass and mid-range sound. The upper ranges can seem a little quiet at times but are still clear overall. They’re semi-open, which might as well be open-back because they’ll still leak sound, but this makes them a good choice for mixing or for general listening. You can even listen to them with one ear! They’re also comfortable, with decent earpads that allow for several hours of wear. Overall, for the price, you can’t beat these. Check them out here.